The Sandinista National Liberation Front ( Spanish: Frente Sandinista de Liberación Nacional, FSLN) is a socialist political party in Nicaragua. 1.1 Origin of the term "Sandinista"
The FSLN originated in the milieu of various oppositional organizations, youth and student groups in the late 1950s and early 1960s. The University of Léon, and the National Autonomous University of Nicaragua (UNAN) in Managua were two of the principal centers of activity. 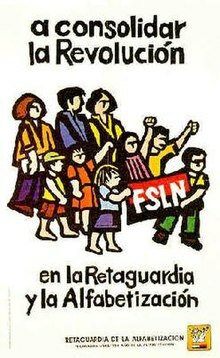 Inspired by the Revolution and the FLN in Algeria, the FSLN itself was founded in 1961 by Carlos Fonseca, Silvio Mayorga [ es; ru], Tomás Borge and others as The National Liberation Front (FLN). Only Tomás Borge lived long enough to see the Sandinista victory in 1979. 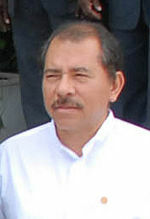 In December 1974, a guerrilla group affiliated with FSLN directed by Eduardo Contreras and Germán Pomares seized government hostages at a party in the house of the Minister of Agriculture in the Managua suburb Los Robles, among them several leading Nicaraguan officials and Somoza relatives. The siege was carefully timed to take place after the departure of the US ambassador from the gathering. At 10:50 pm, a group of 15 young guerrillas and their commanders, Pomares and Contreras, entered the house. They killed the Minister, who tried to shoot them, during the takeover. The guerrillas received US$2 million ransom, and had their official communiqué read over the radio and printed in the newspaper La Prensa. In October 1977, a group of prominent Nicaraguan professionals, business leaders, and clergymen allied with the Terceristas to form "El Grupo de los Doce" (The Group of Twelve) in Costa Rica. The group's main idea was to organize a provisional government in Costa Rica. The new strategy of the Terceristas also included unarmed strikes and rioting by labor and student groups coordinated by the FSLN's "United People's Movement" (Movimiento Pueblo Unido – MPU). Upon assuming office in 1981, U.S. President Ronald Reagan condemned the FSLN for joining with Cuba in supporting "Marxist" revolutionary movements in other Latin American countries such as El Salvador. His administration authorized the CIA to begin financing, arming and training rebels, most of whom were the remnants of Somoza's National Guard, as anti-Sandinista guerrillas that were branded "counter-revolutionary" by leftists (contrarrevolucionarios in Spanish). This was shortened to Contras, a label the force chose to embrace. Edén Pastora and many of the indigenous guerrilla forces, who were not associated with the "Somozistas", also resisted the Sandinistas. During this unrest there were many deaths linked to the violence, as well as many instances of torture, sexual assaults, death threats, intimidation and the ransacking and burning of municipal buildings and pro-government media. In total 253 people died and more than 200 people were injured, with the mostly male victims coming from a cross-section of people, including large numbers of Sandinista supporters and 22 members of the police force. Opposition figures argued that the government was responsible for the violence, a view supported by large parts of the Western press and NGO's such as Amnesty International  . However, other analysts and media sources have described the events as an attempted coup  , criticising Amnesty's reports as grossly inaccurate  and claiming that the violence was primarily perpetrated by opposition supporters and armed thugs . Subsequent to the restoration of order, many have been arrested and tried for violent activities, including murder, and police raids of opposition forces and independent media have occurred  , as the causes of the violence have been investigated by authorities. Carlos Fernando Chamorro, son of former right-wing president Violetta Chamorro and editor of Confidencial, a fiercely anti-government newspaper, left the country after his office were subject to police search in December 2018 . The Catholic hierarchy initially disapproved of the Sandinistas' revolutionary struggle against the Somoza dynasty. The revolutionaries were perceived as proponents of "godless communism" that posed a threat to the traditionally privileged place that the Church occupied within Nicaraguan society. Nevertheless, the increasing corruption and repression characterizing the Somoza rule and the likelihood that the Sandinistas would emerge victorious ultimately influenced Archbishop Miguel Obando y Bravo to declare formal support for the Sandinistas' armed struggle. Throughout the revolutionary struggle, the Sandinistas had the grassroots support of clergy who were influenced by the reforming zeal of Vatican II and dedicated to a " preferential option for the poor" (for comparison, see liberation theology). Numerous Christian base communities (CEBs) were created in which lower level clergy and laity took part in consciousness raising initiatives to educate the peasants about the institutionalized violence they were suffering from. Some priests took a more active role in supporting the revolutionary struggle. For example, Father Gaspar García Laviana took up arms and became a member of FSLN. In the gay cult classic film To Wong Foo, Thanks for Everything! Julie Newmar (1995), Vida ( Patrick Swayze) was trying to convince Noxeema Jackson ( Wesley Snipes) to take a young drag queen, Chi-Chi Rodriguez, to Hollywood to compete in a drag competition. Noxeema was totally against the idea and quotes this line: "Mmm, Mmm, Mmm, not on your young queer life—you and your causes. That child is Latin, you don't wanna get mixed up in all that Latin mess ... she might turn out to be a Sandinista or something." The Chilean new wave group Los Prisioneros mention the Sandinistas in their song " ¿Quién mató a Marilyn? [ es]", in a passage asking, "Who killed Marilyn Monroe?" The song was released on the 1984 album La voz de los '80 [ es] (Spanish for The Voice of the 80s). As a reaction to an anti-Sandinista statement by British Prime Minister Margaret Thatcher and her proposal to ban the use of the word itself, punk rock group The Clash used the title Sandinista! (1980) for their fourth studio album. The triple album contains the song " Washington Bullets", which references the Sandinistas and other events and groups involved in Latin American history, starting from 1959. ^ The FSLN official website may once have named the following as founders: Santos López (former Sandino fighter), Carlos Fonseca, Silvio Mayorga, Tomás Borge, Germán Pomares Ordonez, Jorge Navarro, Julio Buitrago, Faustino Ruiz, Rigoberto Cruz and José Benito Escobar Pérez. The original citation, dated March 30, 2009, was to http://www.fsln-nicaragua.com[ permanent dead link] "History of Nicaragua's FSLN." The page no longer lists the names shown above, and appears to be a commercial site, not the FSLN's site (November 2009). ^ Fernandez Poncela, Anna M.; Bill Steiger (1996). "The Disruptions of Adjustment: Women in Nicaragua". Latin American Perspectives. 23 (1): 49–66. doi: 10.1177/0094582X9602300104. Kinzer, Stephen. Blood of Brothers: Life and War in Nicaragua, Putnam Pub Group, ISBN 0-399-13594-4, 1991. 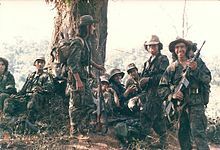 Wikimedia Commons has media related to Sandinista National Liberation Front.